Here I sit 12,000 miles away from Panther, and yet on my desk is his Oric. Tis a funny old world, what's even more strange - is that it is working away happily beside me, probably the first time it has worked in years, decades possibly, it seems happy. 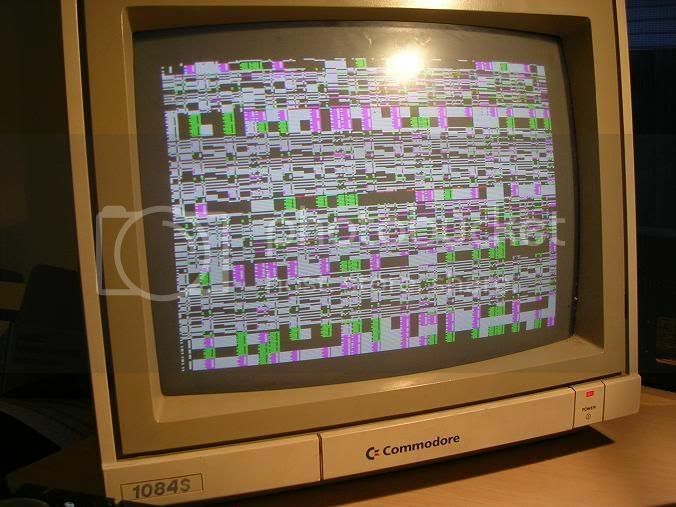 I have had it here for about 2 months, nature conspired against me fixing it a number of times, firstly my trusty Commodore 1084S decided it didn't want to be a monitor anymore, it took me about a month to work out how to convince it otherwise - monitors aint my thang. Then yesterday when I was ready to tackle it once more my bench power supply decided it wanted a change of career too. That turned out to be a manufacturing fault, am surprised it had lasted as long as it had. ...lots of pretty coloured crap on the screen, somewhat inconsistent pattern tho. Always a good candidate for a fix, first thoughts tend to be RAM RAM RAM. Oh actually the first thought is always power supply, but as that's external you really only have to check the voltage regulator and you can move one. 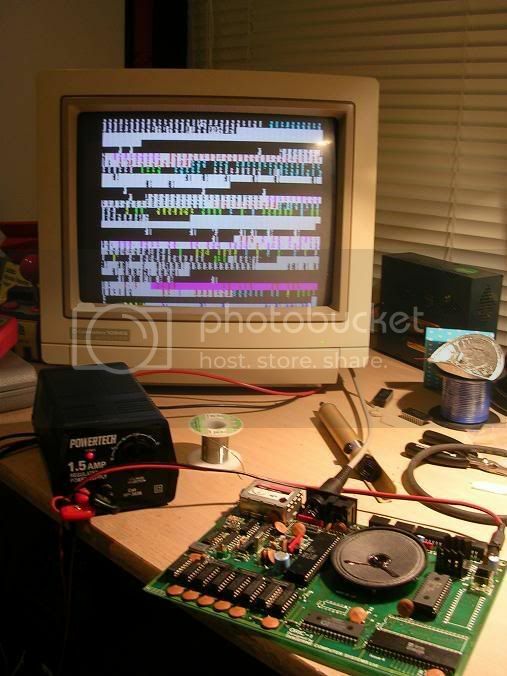 Tangerine computers were renowned for buying really really cheap and nasty RAM chips, they were ones that had failed the manufacturers QC, but worked just well enough to go into an Oric that didnt drive them too hard. 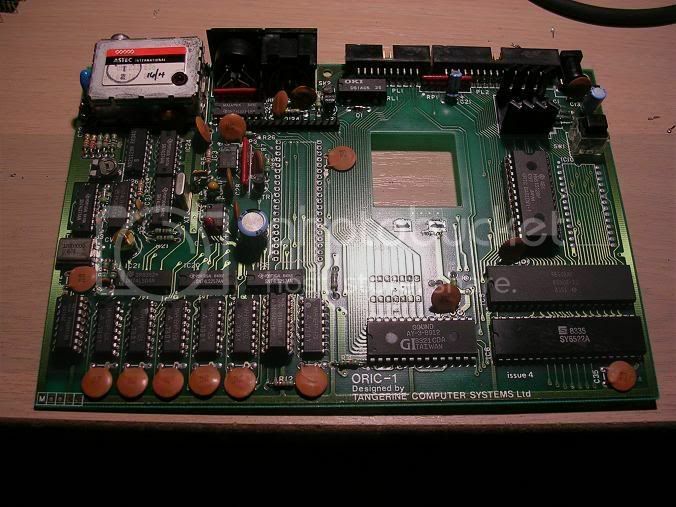 The failure rate was alarming in the early days and its quite uncommon to see an Oric with all its original RAM, Panthers had already had 2 chips replaced. So after a quick buzz round the board with a logic probe I removed the remaining RAM, soldered in a batch from my stock and prepared to bask in the glory of a quick fix. The speaker is a pain in the rear as its only mounted on two tags and it flops about a bit due to its weight, so that came out for a while too to make it easier to work with. I was disappointed - even with the new RAM it was ill, similar pattered effect as before, and as I had soldered in the RAM I couldn't even swap it around a bit as now seemed to be required, the Oric is a very very fussy machine and juggling the RAM chips on my old Atmos chased away some boot up problems. 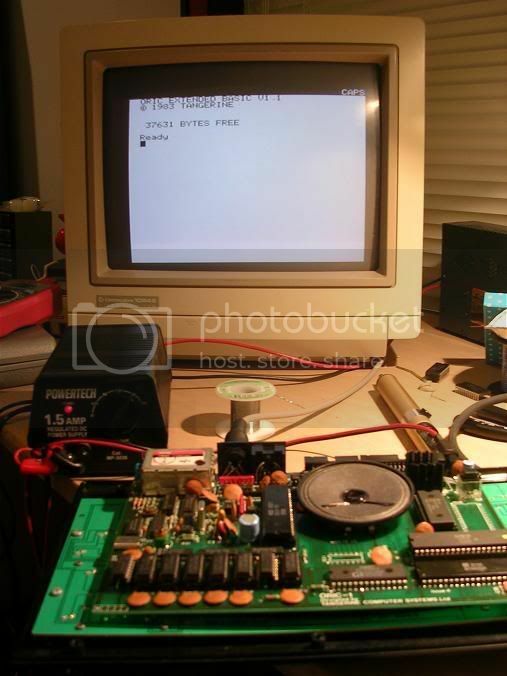 I am lucky to have another Oric here that I fixed ages ago, when that has all its RAM removed it puts up a messy black and white display on the screen that keeps resetting, presumably Panthers Oric should do the same without RAM, thus allowing comparison between the boards with RAM out of the equation. So I unsoldered the RAM from Panthers board to see what it did sans RAM - nothing similar to mine was the answer. Lots of crap on the screen, colourful tho. I quickly dumped the eprom and compared the binary file with my Orics eprom dump, they were identical, no clues there. At this point I was stuck, which way to go next? Orics are simple beasts and as such they either tend to work fully, or not at all, there is no half way house to give you any clues. Based on Speccy (similar architecture) faults I knew a duff ULA would give weird results, and that they are not uncommon failures, and indeed the lines on Panthers ULA were doing different things to my Oric, then again whatever was causing the fault could be driving that, and it may not be ULA at fault. Anyway - my ULA was socketed from birth, Panthers was soldered directly to the board, so I desoldered it and plopped it into my board, and was greeted by a fully working Oric - arse - so not the ULA then. Having replaced the RAM the crap on the screen was slightly more consistent and this was reassuring, we will never know if the original RAM was good or not as I had to cut it loose to avoid damaging the board, but a consistent fault is better than a random one, RAM faults tend to look random so perhaps there was an issue there originally. 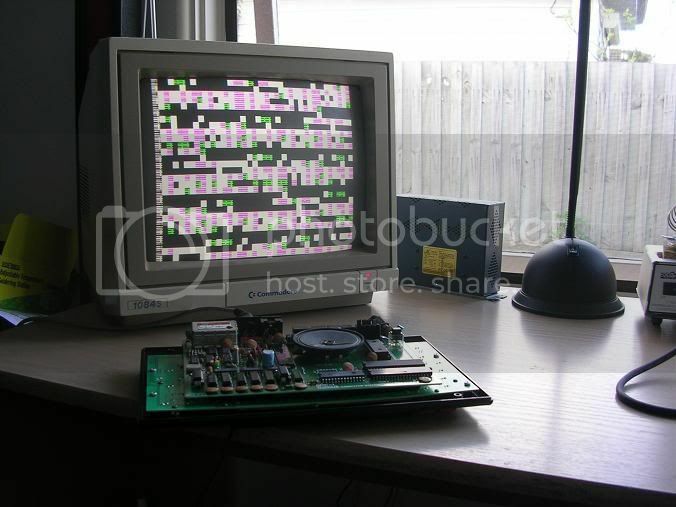 A static screen of rubbish now looked like a CPU fault - my repairs of Capcom A arcade boards has yeilded a small pile of dead Z80 CPUs and I tend to slap them into my Galaxians board to see what they do, the results are heavily dependant on what is in the associated EPROMs so the rubbish is not going to be directly comparable, but there was a fishy similarity. So fired up the desolder station and whipped out the 6502 CPU chip. While the board was CPUless I decided to see what the board did when powered up, surprise surprise it did a damn good impression of the main fault, it seems even with the CPU chip on board the machine is missing its CPU. 6502s were old school by the mid 1980s and none of my scrap boards date from then, any boards I do have that are older are all Z80 based. 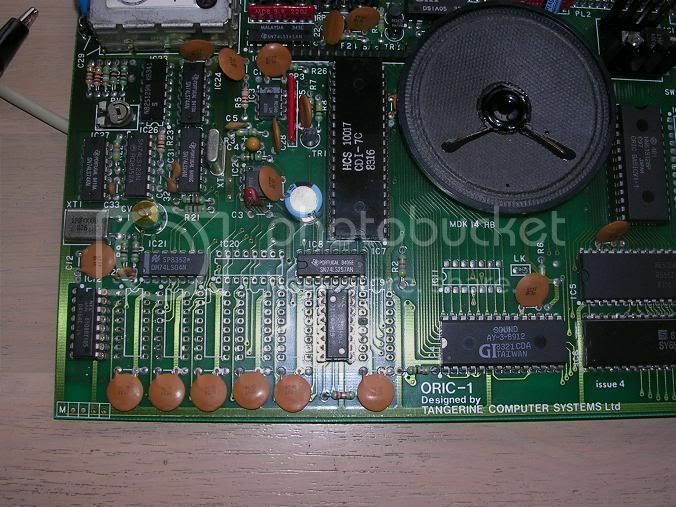 My Orics CPU was soldered in and I was not keen to subject it to a desoldering. So I hit google hoping to find a supplier or ebay seller, turns out I had one within ten feet of me, in my Commodore 64 1541 floppy drive. It also had the PIA chip that goes with the 6502 which was my other prime suspect. 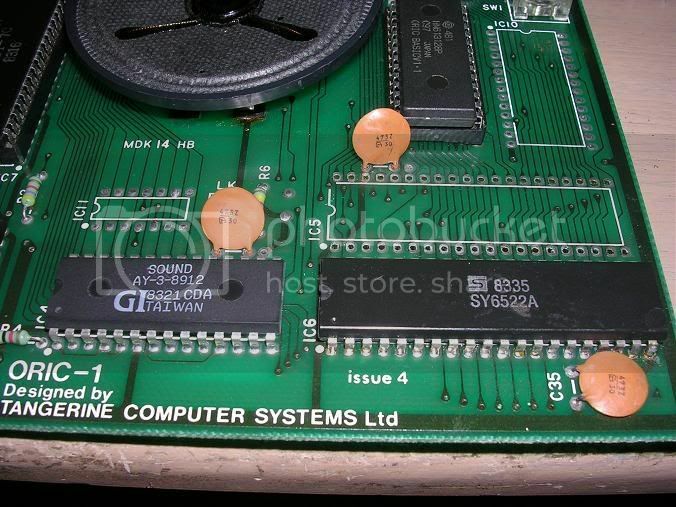 Both were luckily in sockets so I whipped the CPU out, fitted a socket on the Oric board and installed the CPU. ....signs of life, the system was booting but freezing almost instantly. 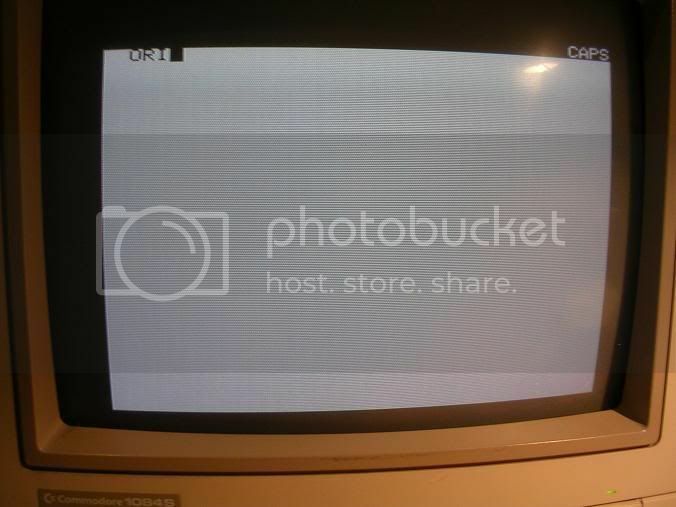 This was going to be either a faulty PIA chip or more RAM problems. I was planning to replace each chip 1 by 1 along the RAM bank, but infact on replacing the 1st RAM chip the system booted and beeped happily. One working Oric, and an addition to Womble's knackered CPU pile. Need to find a 6502 chip from my contact out West and this fella can wing its way back to Panther. It looks like old school to me especially the monitor and its great to see how the fixing is being documented.